France and Nigeria will face-off in a World Cup 2014 round of 16 match. Kick-off time is 12:00 p.m. EDT at Estádio Nacional Mané Garrincha, Brasilia. The game will be broadcast on TF1 and beIN Sports 1 in France, as well as SuperSport Select, SLGO, Canal+ Centre, and Canal+ Ouest in Nigeria. The game will also air on TalkSport Radio, BBC One UK, BBC Red Button, and BBC Radio 5 Live in the United Kingdom, as well as ESPN Deportes+, SiriusXM FC, ESPN, Univision Deportes USA, ESPN Deportes, ESPN Deportes Radio, Univision USA, ESPN Radio, Futbol de Primera Radio, and Univision Deportes En Vivo in the United States. Live stream is available on beIN SPORTS CONNECT, BBC iPlayer, and Watch ESPN. Here is an Associated Press preview of the match. RIBEIRAO PRETO, Brazil (AP) — The pace and power of Nigeria’s attack will give France’s defense its biggest test of the World Cup so far when they meet in Monday’s round of 16 match. Although France kept two clean sheets in the group stage — against Honduras and Ecuador — the variety in the African champion’s forward line offers a much stiffer proposition, and it has already caused problems for bigger teams than France. Winger Ahmed Musa will be closely marked after scoring both goals in a 3-2 loss to Argentina. His speed was a constant threat and he will look to expose the space behind France’s fullbacks — who are given license to push up in coach Didier Deschamps’ attack-minded team. Emmanuel Emenike is a bustling, powerful striker, and veteran forward Peter Odemwingie has the technical ability to unlock defenses and has shown in the Premier League with West Bromwich Albion and Stoke that he is also a sharp finisher. It will be Nigeria’s first knockout game at a World Cup since 1998 — the year France won the tournament as host — and preparations have hardly been ideal, with Thursday’s training session canceled amid reports of a pay dispute. Four years ago, it was France that was in turmoil before its final group game after going on strike at training. The official line for why Nigeria didn’t turn up for the practice was that a team meeting ran too long, but reports said players were demanding bonuses owed to them. Fellow West African teams Cameroon and Ghana both had their campaigns disrupted by pay disputes. Sagna is battling with Mathieu Debuchy for the right back slot and center half Mamadou Sakho is struggling for fitness with a left hamstring injury. If he fails to recover, Laurent Koscielny will replace him at center half alongside Raphael Varane. But they have started only a handful of games together and Nigeria has enough attacking threat to expose that inexperienced partnership. France likes to dictate play, but given Nigeria’s propensity to throw players forward, Deschamps may pick his team with quick counterattacks in mind. He has yet to truly decide what his favored lineup is, making surprise selections in all three group games so far. 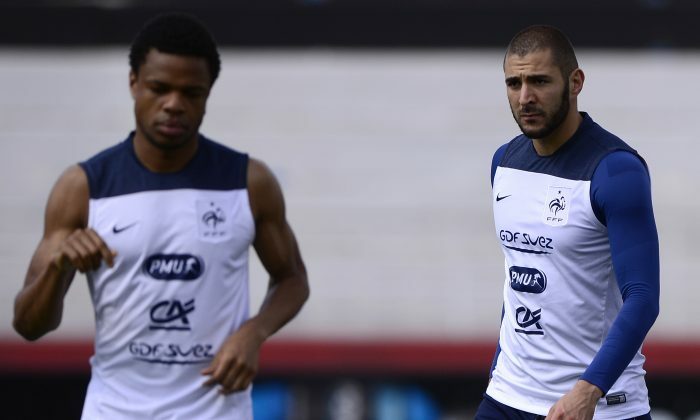 Olivier Giroud and Antoine Griezmann are challenging for a starting spot alongside Karim Benzema and Mathieu Valbuena in France’s three-pronged attack, while Paul Pogba and Moussa Sissoko are contesting a place in midfield. Griezmann and Sissoko are quicker players and better suited to playing on the break than Giroud and Pogba. But Deschamps’ final decision could be influenced by the volatility of Giroud and Pogba. Both have escaped straight red cards: Giroud for elbowing Ecuador’s Gabriel Achilier and Pogba for aiming a wild kick at Wilson Palacios against Honduras. Sakho also avoided a potential sending off for elbowing an Ecuador player in the face, and French nerves will have to hold firm in Brasilia. “You must do all you can to concentrate, and to stay calm in the difficult moments,” Sagna said.